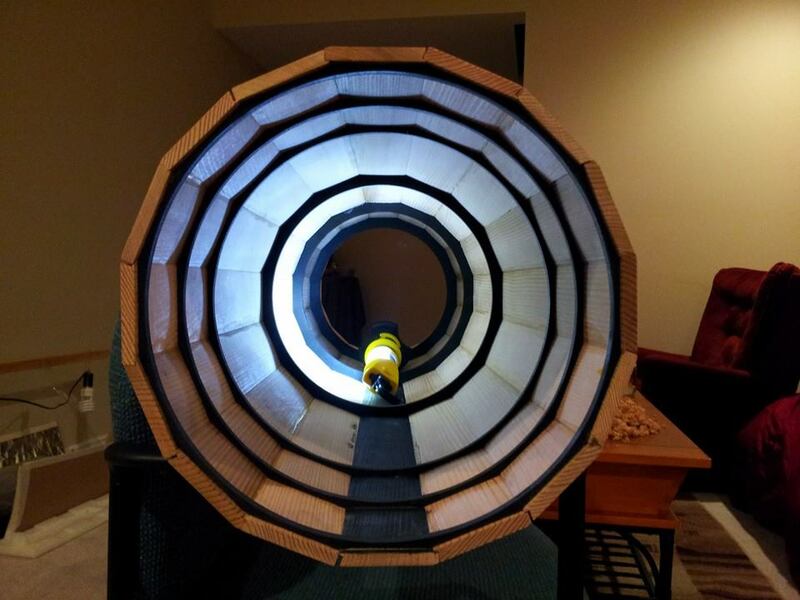 I recently completed the tube of my 8 inches telescope. For this project, I didn’t have any plans so I had to spend a lot of time figuring out the appropriate dimensions of each elements. 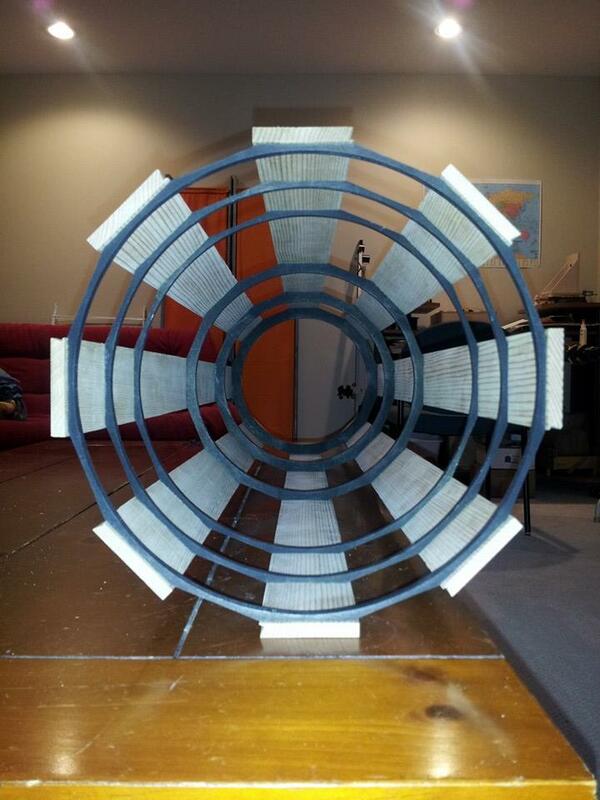 While I was building the primary mirror, I used Mel Bartels‘s website a lot. It really is a very good source of information and advice for anyone building fast telescopes. 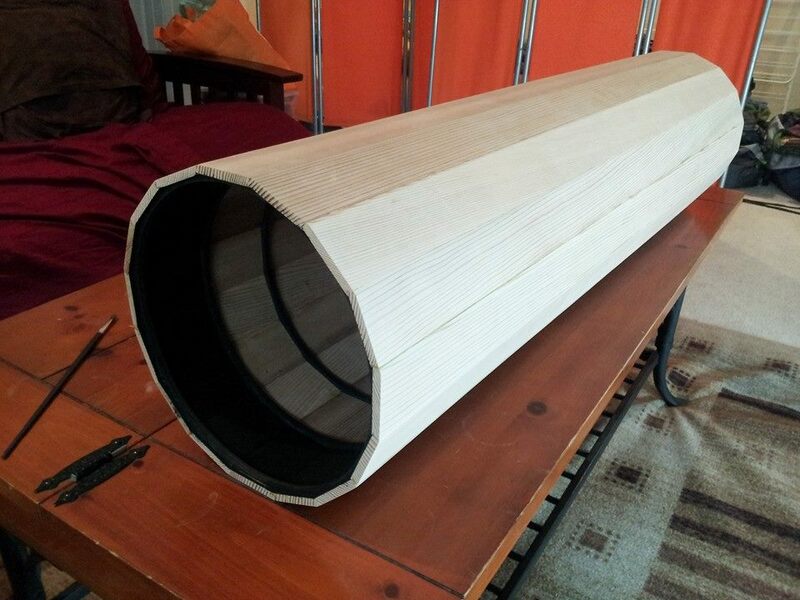 One of his recent project is a 10.5 inches F2.7 dobsonian telescope. 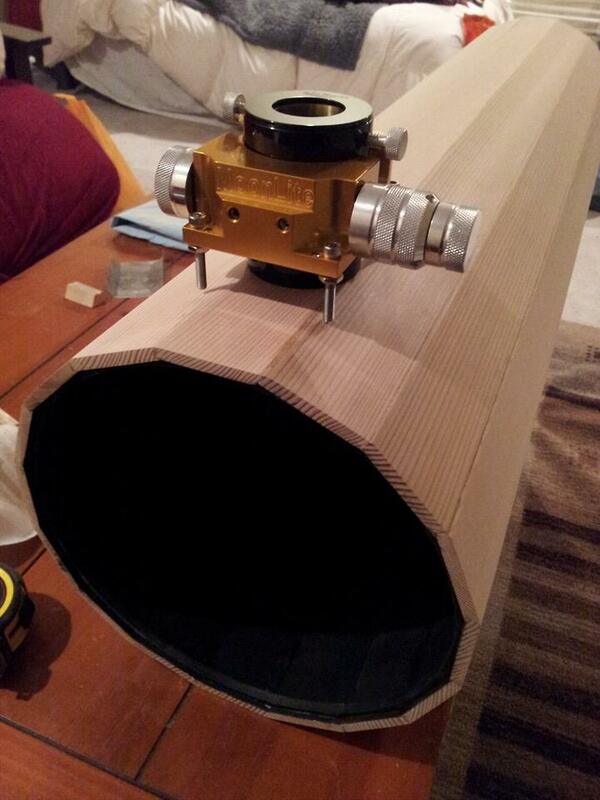 I really liked the hexagonal design of the tube and I started to look for other geometric wooden telescope. 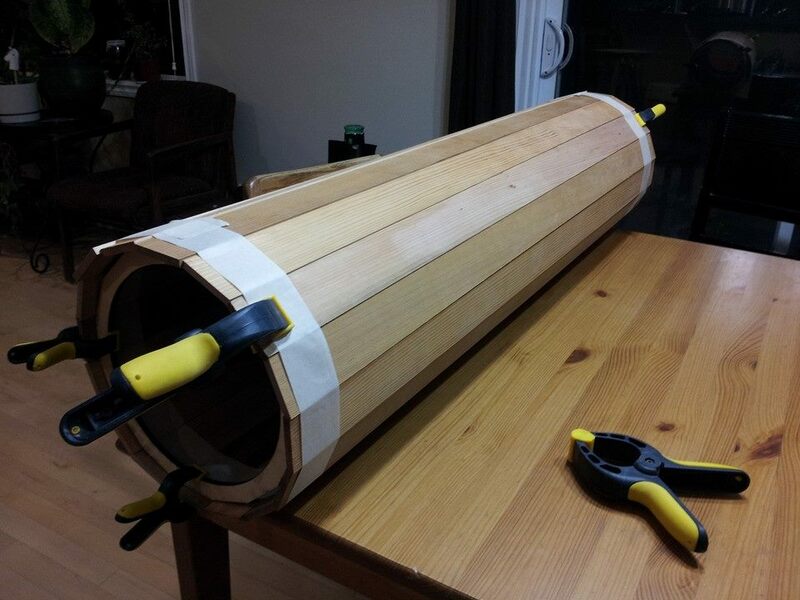 As an amateur woodworker, I didn’t want to go with Sonotube or PVC and I wanted to avoid plywood if possible. 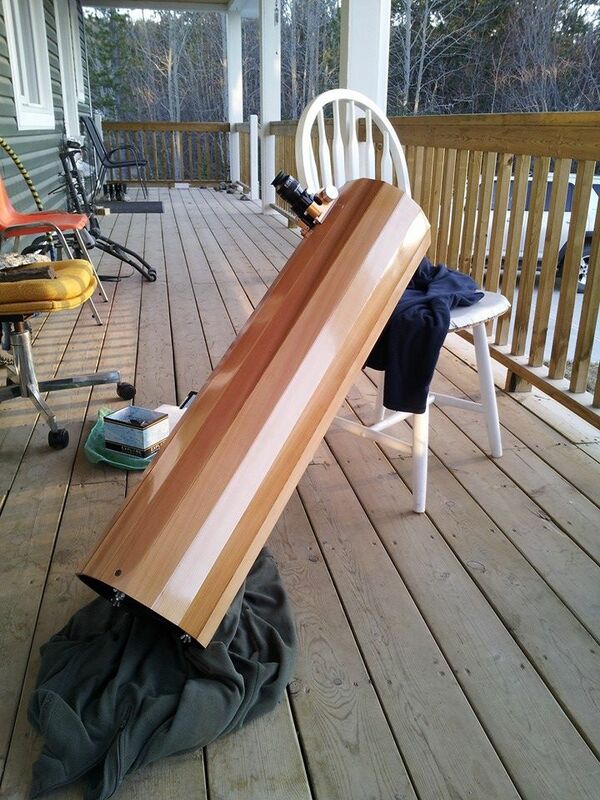 Here’s another beautiful telescope I found on Stargazers Lounge. It has an octagonal structure and is made out of walnut. The build quality is just remarkable. 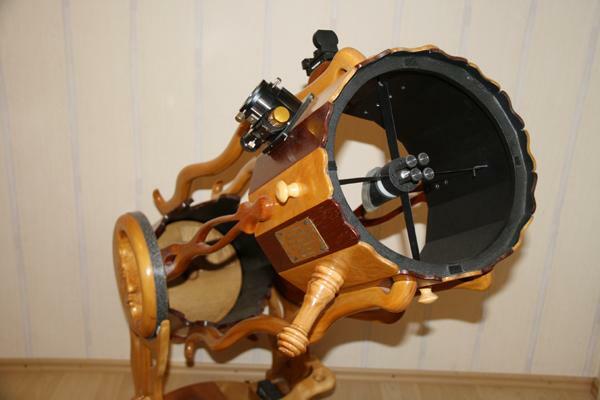 Finally, I stumbled upon Normand Fullum wooden telescopes which seem to be coming straight from a Jules Verne book. 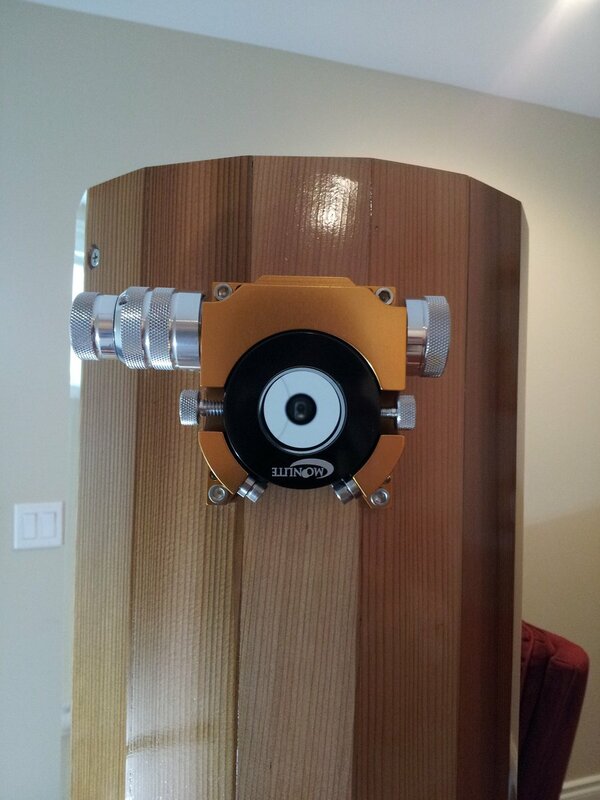 The scopes have a 16 faced hardwood structure and the mounts are totally out of the ordinary. 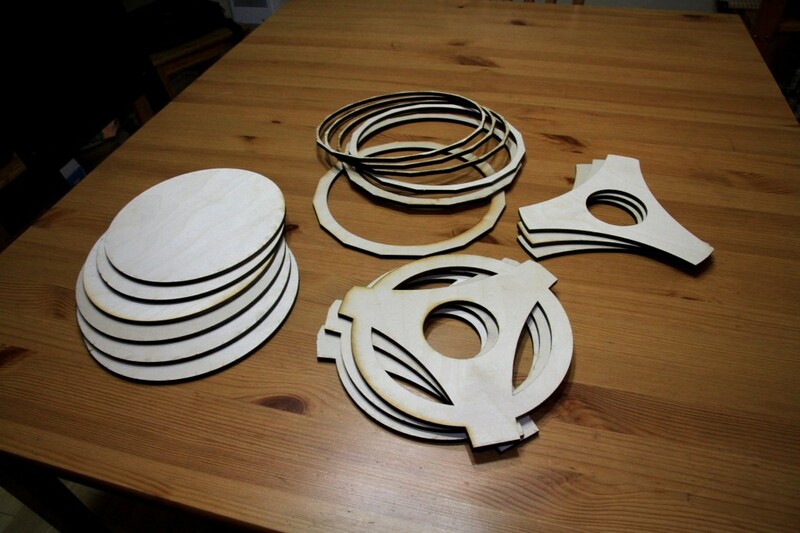 With all these ideas in my head, I started to look for wood to make and octagonal scope. I was given some Western Red Cedar trims which unfortunately where not large enough to build a big enough octagnal structure. I decided to double the number of sides and go with a Hexadecagonal tube (16 sides). After resawing, planing and sanding I had 16 boards 1/4 inch thick. To make sure my design would work, I used Newt for the Web which enabled me to test the absence of vignetting, the right position of the focuser, the size of the elliptical, etc. Using this software, I realized it was calculating the position for baffles which are designed to block internal reflection on the tube. I originally didn’t plan on including those but I realized they would help me give strength to the instrument. 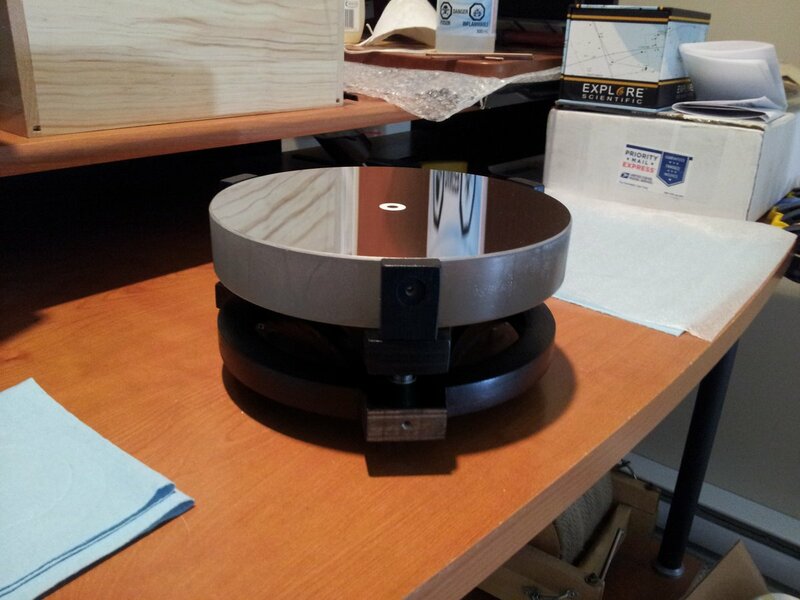 Once I finalized the design using Newt, I ordered an elliptical mirror (1.83 in L/18) from Antares Optics. I also started to design the baffles using Inkscape. The 3 baffles closer to the front of the tube where so thin, I had to laser cut them on an Epilog laser cutter at the local hackerspace (Yukonstruct). With the baffles cut, I started to think about how I would glue the 16 sides together. 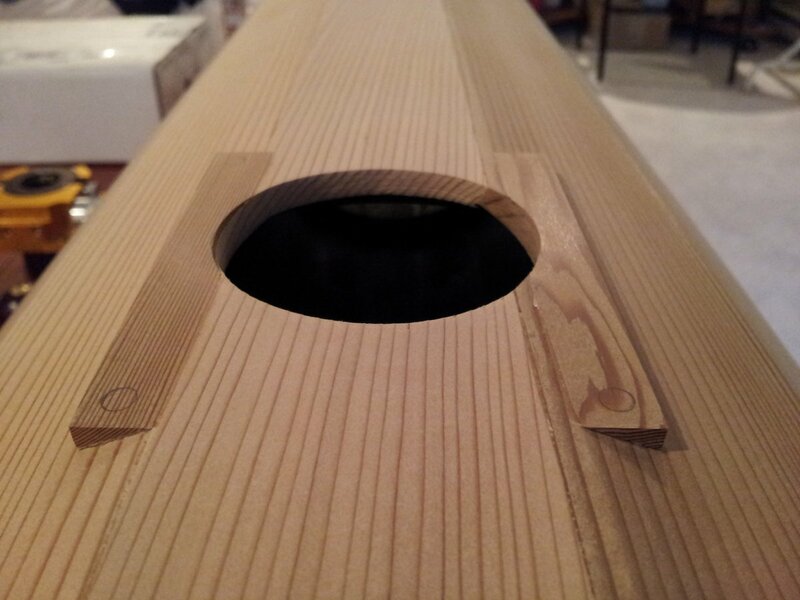 A friend of mine mentioned using bird’s mouth joinery. 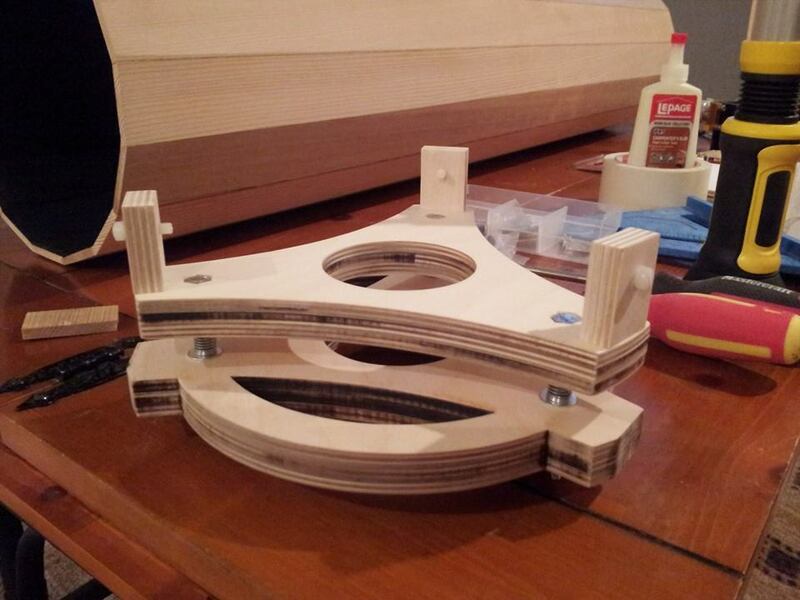 It would give strength and ease of clamping during the gluing process. 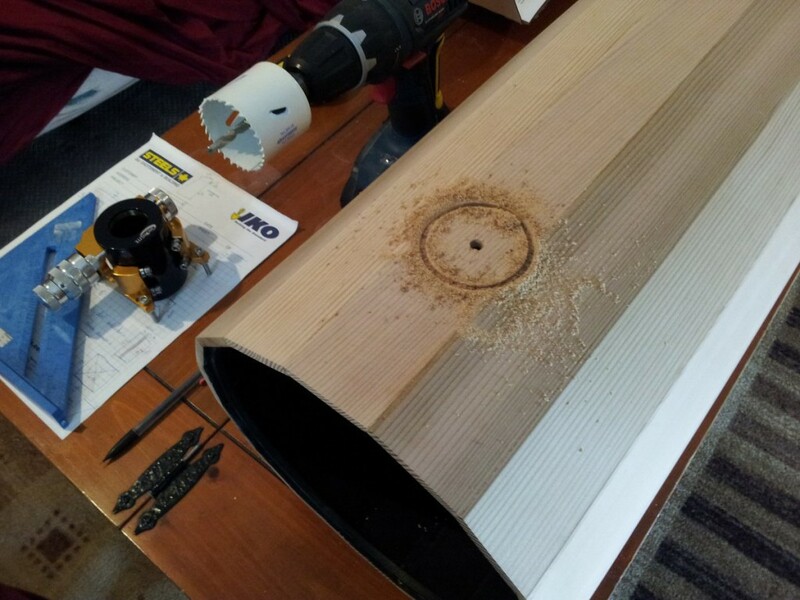 I bought a kit of bird’s mouth router bits from Busy Bee Tools and routed one side of each board. Then I taped the boards together and placed them around the baffles for a test. That gave me a rough idea of what size I needed for each board. After hand-planing the boards on the non-routed side, I started to glue them on the baffles on every other segment of the hexadecagon. 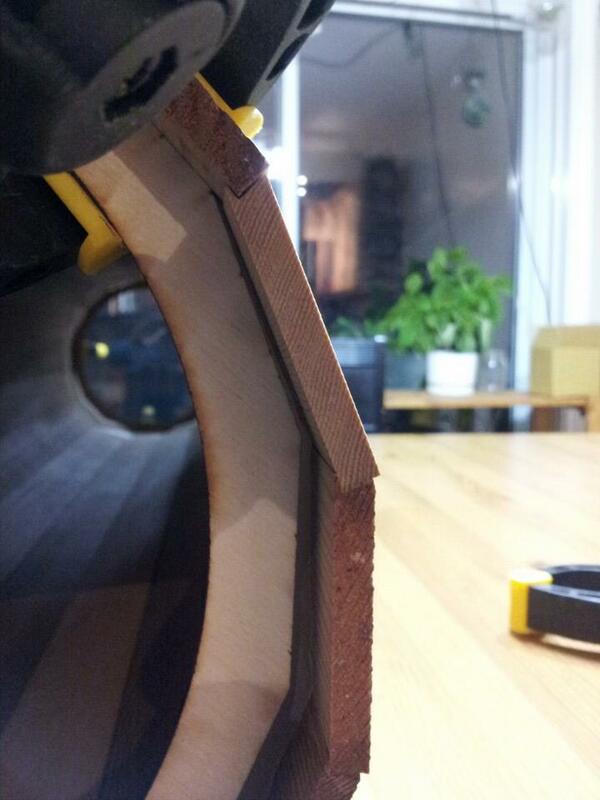 I glued the other sides after adjusting their size by hand to get them to fit properly. 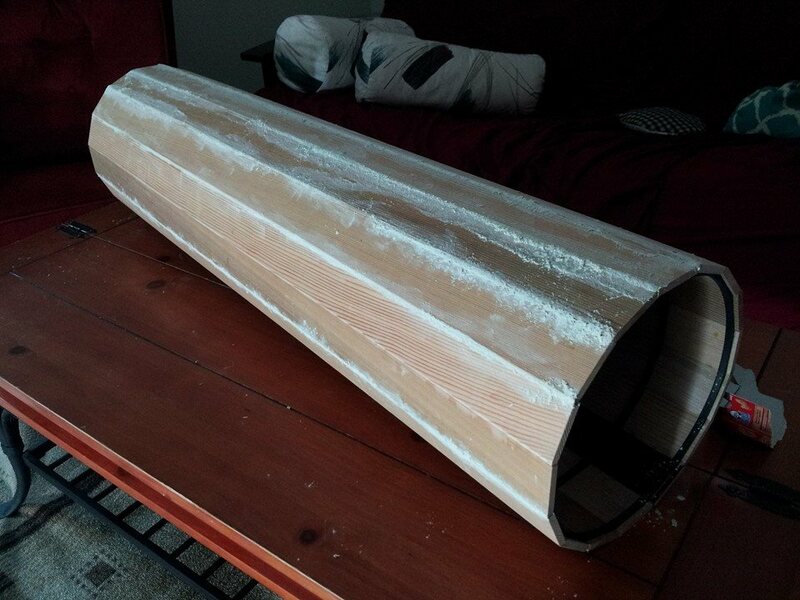 Once the tube was complete, I sanded the edges and faces using 100, 220, 400 and 600 grit. I also coated it with 5 coats of spar varnish on the outside and india ink on the inside. I applied 3 coats of spray polyurethane to waterproof the inside. 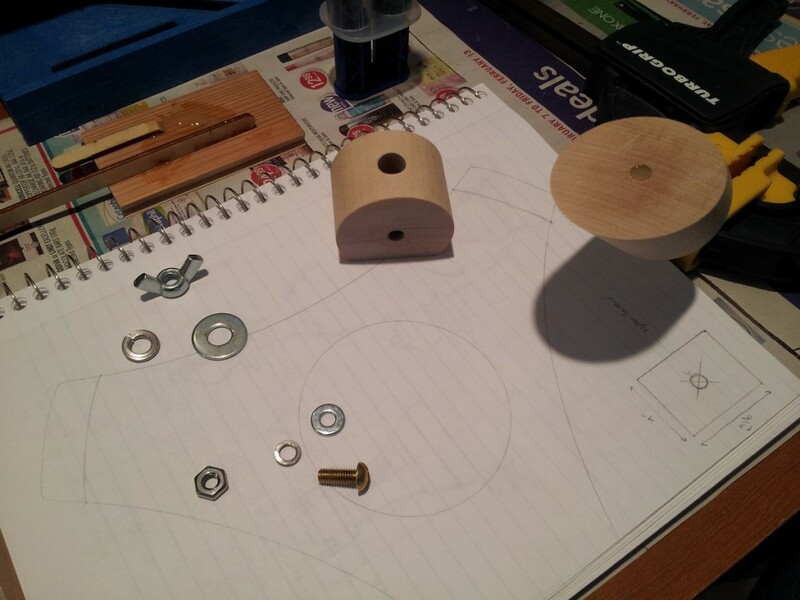 The next step was to drill a hole large enough for the focuser. I bought a Moonlight Crayford with a 2 inches tube and a 1.5 inches travel length. I used a 2.125 saw and filed the edge to make it a bit larger. 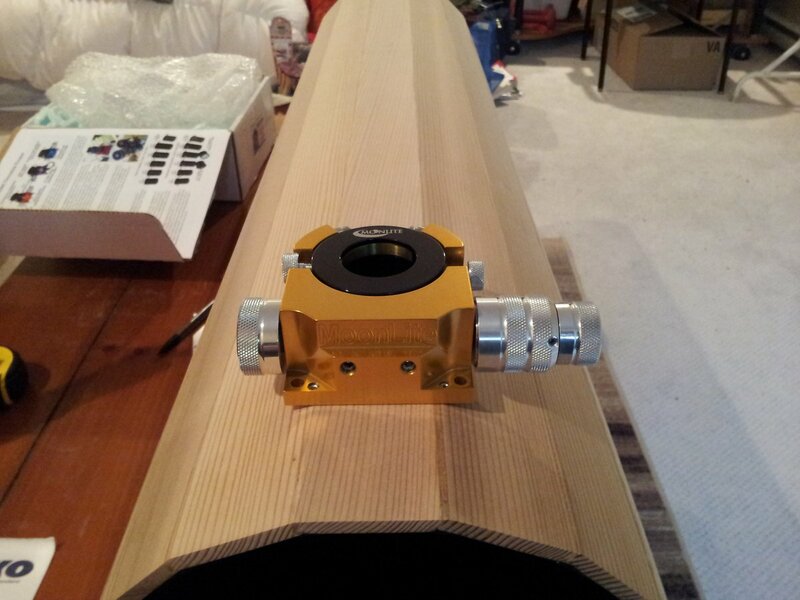 I also had to create small cedar parts to accommodate the width of the focuser and the shape of the tube. I then drilled 4 holes to hold the focuser in place. The next step was the primary mirror cell. I created it the same way I did for the baffles by making an SVG file and cutting it with the laser. 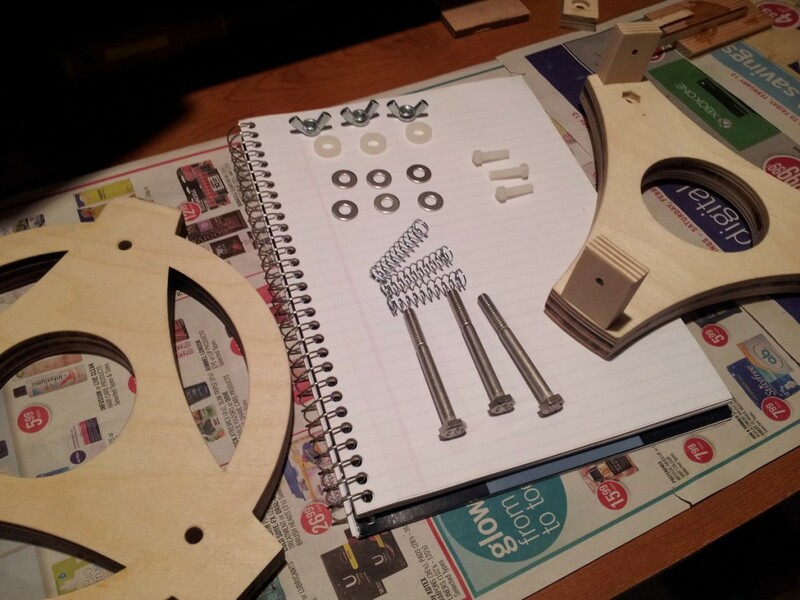 I used 1/4 inch baltic birch plywood so I had to glue 3 parts to get a good support. I used standard hardware (hex bolts, wing nuts, nylon washers and screws, compression springs) and painted the wood black and applied polyurethane on it. 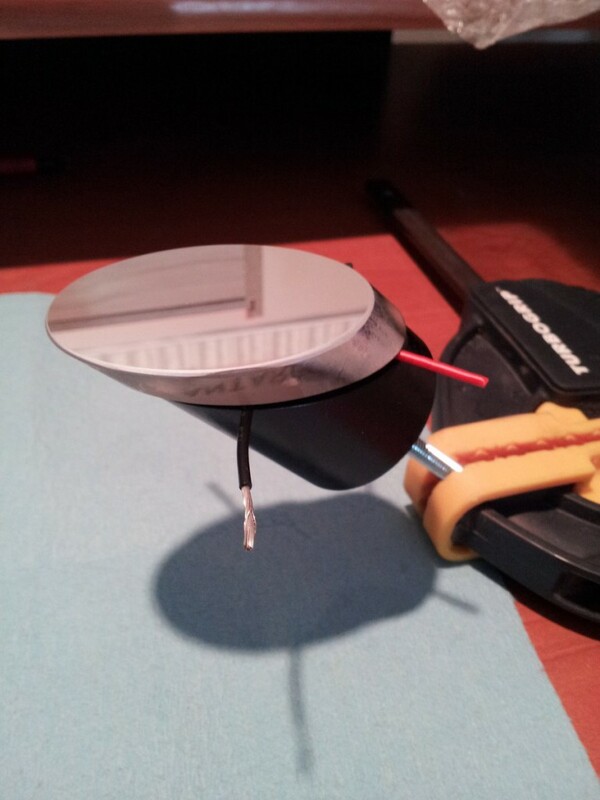 The primary mirror rests on 3 silicon glue dots and is maintained on the side by 3 nylon screws. The secondary mirror holder is inspired by Gary Seronik’s design. 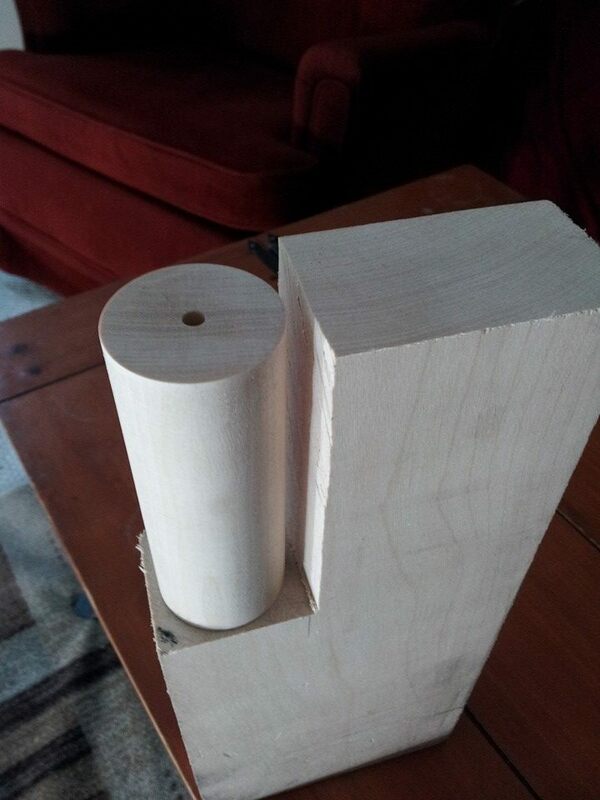 I used a steel ruler for support and made a dowel from 2 inches thick birch stock. 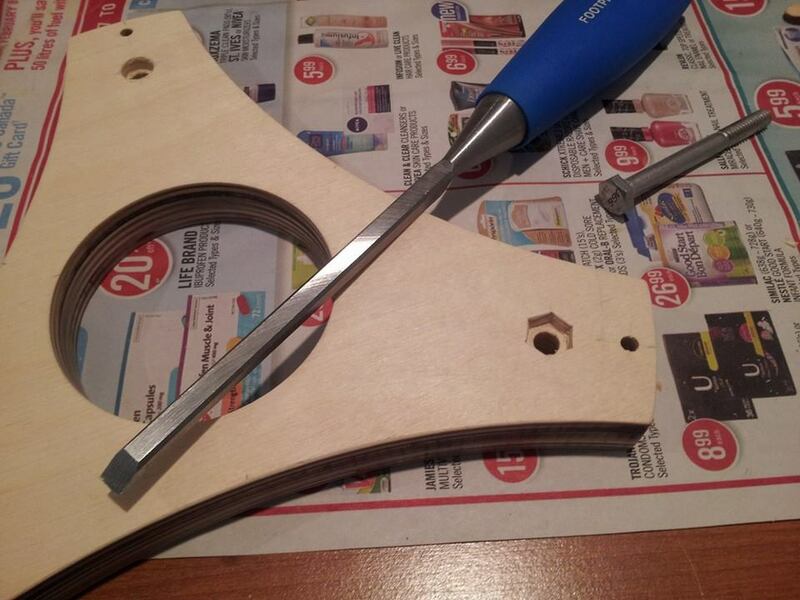 The mirror is glued to the dowel using silicon glue. The first light was on may 3rd as I aimed at Venus with the sun still shining. I could clearly see the gibbous phase with an 11mm Explore Scientific wide angle eyepiece. I could see a slight bit of chromatic aberration on Venus but that probably comes from a bad manual collimation. I then spotted Jupiter with sun still above the horizon and I got a dramatically sharp view of the planet with 2 bands clearly visible and a transit of Callisto. Europa and Ganymede where really sharp too. For a scope not intended for planetary observation, I am really pleased with the results and can’t wait for the darkness to come back in August to hunt for galaxies. 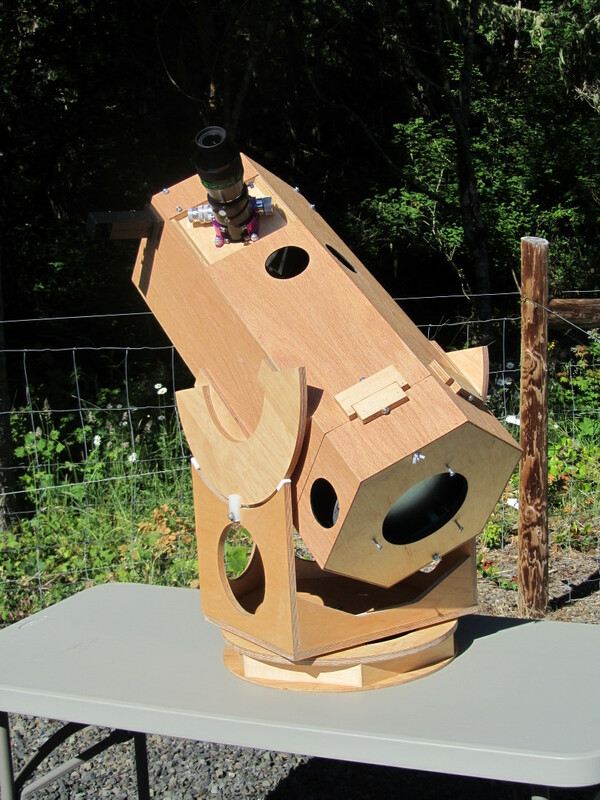 If you want to build a similar telescope, you can download the .newt and .svg files I used for the design. Thanks for so much detail and a great site. 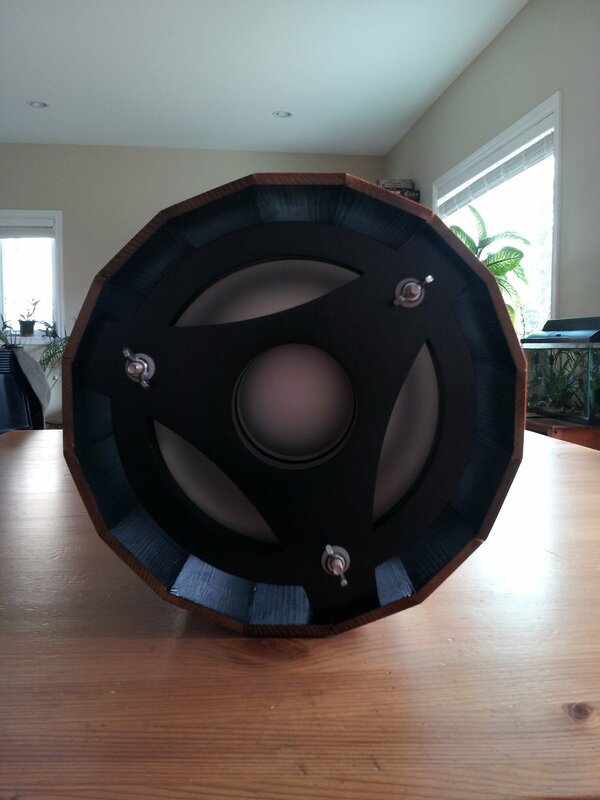 Good luck with your 8″ project. I find it to be a really good compromise between aperture and ease of use. Wow… I am inspired. 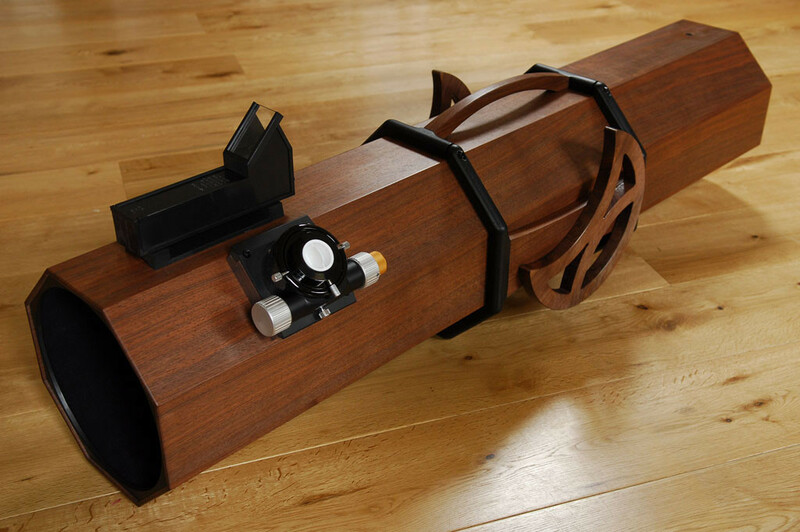 I have been considering a DIY scope for some time and have thought about doing something very similar to what you’ve designed. It is a beauty and I hope I can pull off something half as beautiful. Thank you for posting this.